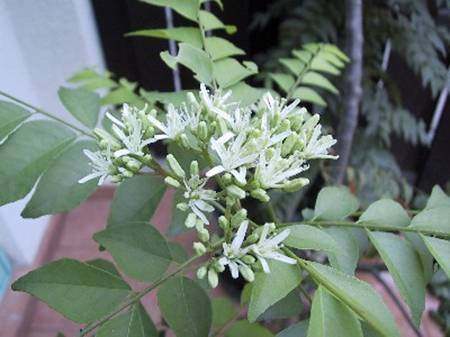 I love eating curries and one of the most important ingredient is fresh curry leaves. Although these can be easily bought in wet markets, they do not keep very well. Once they dry out, they lose their nice fragrance. So I decided to grow the plant at home. Now whenever my wife wants to cook a curry dish, she plucks some fresh leaves and throws it into the stew. 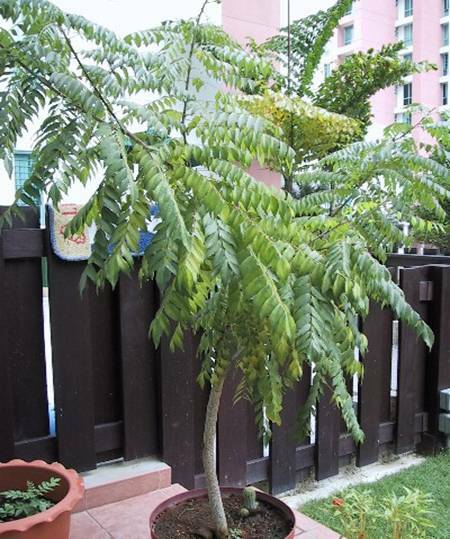 I tried stem cuttings from my mother's curry tree but it did not work. My mother finally bought a small plant about a foot high from a nursery and I tended it until I had seeds from it. The temperature in Singapore ranges between 25 ºC and 33 ºC. It is bright and sunny all year round. From seeds to tiny plants like this, it took about about 2 months or so. This was the original 1 foot tall plant. After 2.5 years it is now about 5 feet tall. Notice the sickly yellow leaves. I tried all sorts of ways and means to fertilize it unsuccessfully. By chance came across a book on bonsai and using the same principles, I decided to try pruning the sickly leaves. I took a deep breath, risked the tree dying and started to prune off all the sickly leaves. I prune off 1/3 of the plant and waited to see if the plant would die. 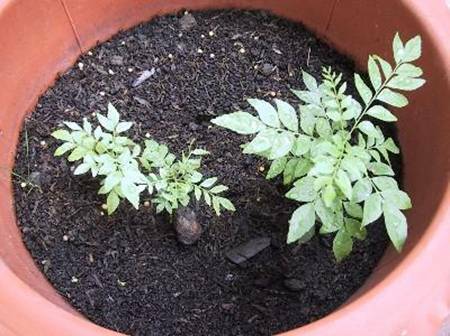 Instead, two weeks later new shoots, leaves and flowers started to sprout. Encouraged, I pruned off another 1/3 of the sickly leaves and waited for another 2 weeks for the new growth. Finally, I trimmed off all the sickly yellow leaves. Incredulously, everything grew nicely. One can say that my curry plant is now in the "green" of health! As a result of the massive pruning, lots of flowers appeared and a lot of butterflies visited the plant. Very soon, caterpillers appeared. I kept them as pets for my 2.5 year old daughter, Faith. She fed these caterpillers with lovely freshly cut curry leaves and they grew big and succulent. Soon they then turned into chrysalis and later into butterflies. More of this later where I learnt the hard way why chrysalis are hung from leaves. I intend to keep trimming the branches at the top of the tree to encourage more leaves to grow at the bottom of the plant. 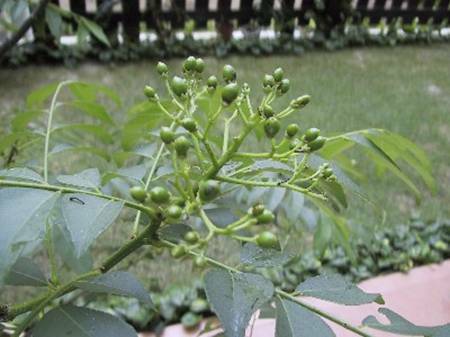 There are tiny buds at the base of branches which starts to grow when you prune off the upper branches. 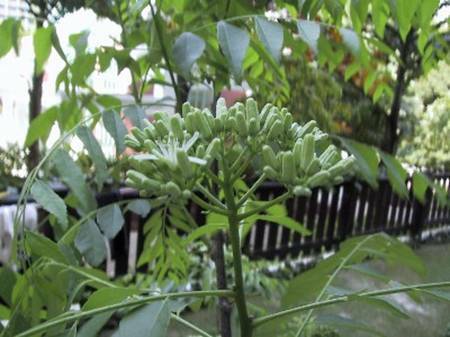 These are the buds of the flowers. These are the flowers, each of which is about 0.4" in diameter. There is only a slight scent of "curry" and it smells rather sweet. Once the flower is pollinated, the petals drop off leaving just the centre portion. Notice that the branches are growing in a spiral radial like formation, the leaves are placed very close together and are asymmetrical. If they were symmetrical, part of the leave would be blocked by others. It is most evident on the left side of the photo. A very clever design which reduces the amount of leaf material needed to the barest minimum if you ask me. 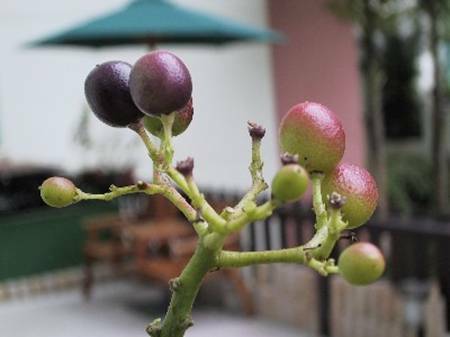 These are the unripen fruits. After a few weeks, they would swell, become fleshy and turn dark purple. This cluster shows various fruits in the stages of ripening. The dark purple ones are ripe. The fruit is about 0.4" in diameter. Somehow birds are able to recognise ripe fruits and they only eat those leaving the unripen ones alone. I was curious as to how the curry fruit would taste. I've seen birds eating it so it should not be poisonous. I broke open a purple fruit and inside was a single seed, 0.25" in diameter, covered with juicy, translucent, light green, flesh like that of a purple grape. The flesh tasted slightly sweet and it has a very slight curry scent, much less than the leaves. 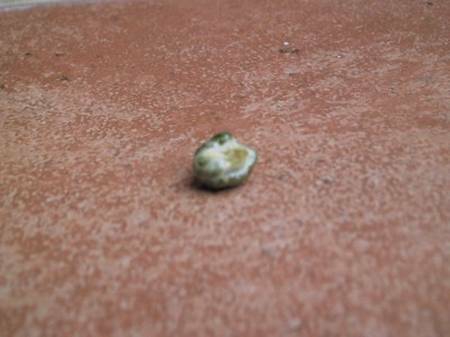 This is how the seed looks like.